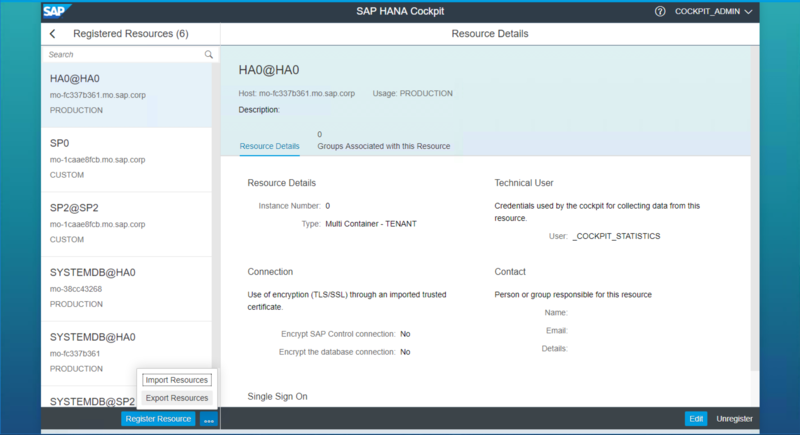 New functionality has been added to the Manage Database page in SAP HANA cockpit. Blacklisted parameters and restricted features for tenant databases have been available since the initial release of multi-tenant database systems. For the configuration, you have set the relevant system parameters. As of cockpit 2.0 SP 03, we can now very easily do this using the tool. Workload Management is also not new but here also we now have the cockpit interface to do the configuration. For the changes to workload management, see the section below. At system startup, all tenant databases that were running before the SAP HANA system was stopped are restarted. Previously, the only way to prevent a particular database from starting is to stop that database before you stop the system. Inconvenient? Yes, sometimes. 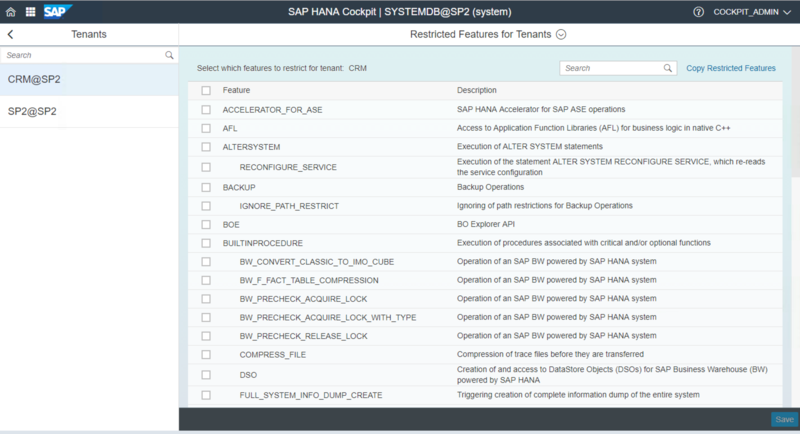 You can now configure the restart mode of a tenant database in HANA cockpit. Workload management, introduced in SPS 10, allows you to manage workloads, that is, making sure that simple OLTP, complex OLAP statements, or long-running data loading jobs all get a fair share of the computing resources (CPU and memory). To manage peak load situations, Admission Control was added to Workload Management in SAP HANA 2.0. This allows you to configure how HANA should handle rush hour and peak times. Works as advertised, so, as of SPS 02, admission control is now enabled by default. 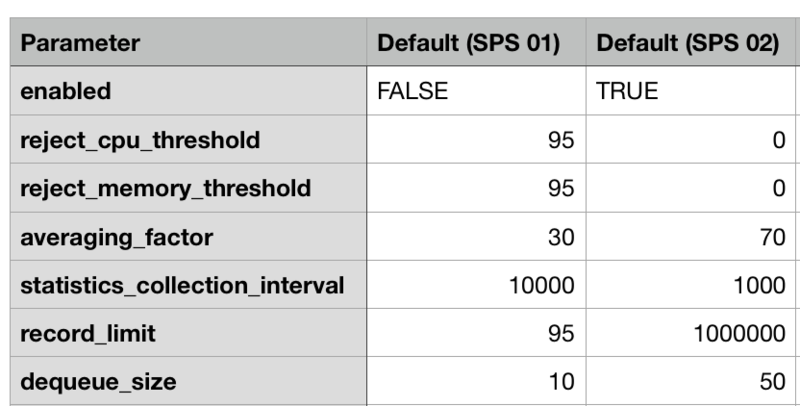 Some of the default values for the configuration parameters have been revised as well. You can install a license specifically for a tenant database. There is no UI for this feature, yet. You implement this with the SET SYSTEM LICENSE command (SQL). By default, the SQL port to a tenant database is fixed and includes the instance number, typically 3<instance_no>13. If you move a tenant database to another system the instance number could very well change. Now what? As of SPS 02, you can specify additional port numbers and map them to the tenant. Any available port number is fine, except 0. There is no UI for this feature, yet. You implement this like you would set any system parameter with an ALTER SYSTEM ALTER CONFIGURATION. To prevent the exposure of the system database SQL port (port 3<instance>13) to the external network, you can now open additional SQL ports. This opens port 17 for SQL requests to the system database and restricts access through port 3<instance>13 for database mapping. The connection through port 3<instance>13 is re-routed to 3<instance>17 if a connection to the system database is required. You still need to make sure that port 3<instance>17 is not exposed to the external network, of course. To enable this feature, set systemdb_separated_sql_port= true in global.ini, section [multidb]. Two new system privileges were introduced to authorize users to start and stop a database: DATABASE START and DATABASE STOP. Both system privileges are part of DATABASE ADMIN. Table replication can help to reduce network traffic when, for example, slowly-changing master data often has to be joined with (partitions of) tables, located on other hosts. It is typically used in distributed (scale out) systems. New in SPS 02 is that you can now replicate data asynchronously from a row store source table to a column store target table. Row store tables typically suit OLTP-type workloads. Column store tables, in general, offer the best performance for analytics workload. Row to column table replication may, therefore, be an optimal replication configuration for mixed workload types to get the best performance from both types of table. There is no UI for this feature, yet. You implement row-to-column-store-table-replication with SQL. Partitioning can help you to manage very large (column-store) tables. It is typically used in distributed (scale out) systems. To optimize query processing on partitioned tables, a background process called pruning is active. It involves the query optimizer analyzing the WHERE clause of queries to determine whether or not the filters match the given partitioning specification of a table. It is based on the partition definition, which does not change, so it is now labeled static pruning. SPS 02 introduces dynamic partition pruning. This is content-based and takes place at run time based on the existence of statistics; it helps to avoid the need to access and load into memory partitions which are not required. For distributed (scale-out) systems, cockpit provides status information on the health of system components on their respective servers, and on resource utilization of hardware components, including CPU, memory, network, and storage on the respective servers on the System Health page. In cockpit 2.0 SP 03, this page has been enhanced with additional functionality. You can now import and export resources from the Cockpit Manager as JSON file. Contact information and technical user login name are optional. The new -attemptencrypt option specifies that encrypted data transmission is used. It is an attempt and if the attempt does not succeed an error message is returned. HDBSQL now recognizes BEGIN … END blocks in a file or interactive input so that you no longer need to modify the script and use the -separatorownline option. The -separatorownline flag has not changed but is now marked as deprecated and probably, eventually, will be removed. To perform table consistency checks, it is no longer necessary to enable the corresponding collector. These checks are now performed automatically. The SAP HANA cockpit for offline administration is no longer required for the administration of offline resources. Initially, SAP HANA cockpit was part of a SAP HANA system. System down? No cockpit. For offline administration, the SAP host agent installed on every HANA system was used with the SAP HANA cockpit for offline administration as its web UI. Now, with SAP HANA cockpit 2.0, this separate tool is no longer required and as of SP 03, all capabilities that could formerly be performed only through the offline cockpit are now included. SAP HANA cockpit for offline administration is still available but, who knows? Some day, it might be gone. The documentation recommends using the SAP HANA cockpit for both on- and offline activities. Offline functions available for a stopped system. Saying goodbye to the SHC4OA. The SAP HANA Academy provides free online video tutorials for the developers, consultants, partners, and customers of SAP HANA. Question to everyone: Regarding the feature “Restricted SQL Access” I’m questioning where exactly the benefit lays, when we open another SQL port, and also need to secure this port to the external network. Since there is a re-routing set from port 3 – instance number – 13 to 3 – instance number – 17, why is it more secure? Does anyone questioned this before and came to an explanation? Or does anybody here already set up this feature in productive environment and is able to share the experiences? It is probably best to post your question to https://answers.sap.com/questions/ask.html. The comment section under a blog is more intended for comments related to that blog.